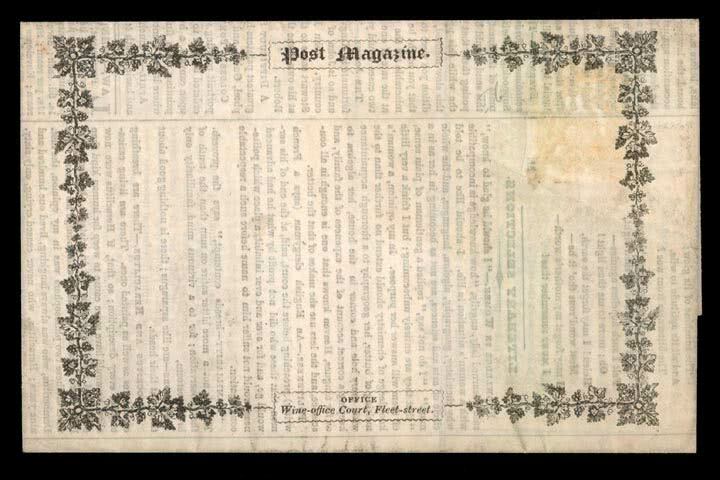 Postal History and Covers: 1840(c.) Post Magazine, an unused example (gum remnants where stamp removed), a little soiled, scarce. Photo. Collections and Mixed Lots: 1840–79 various with covers incl. 1840 Mulready 1d. 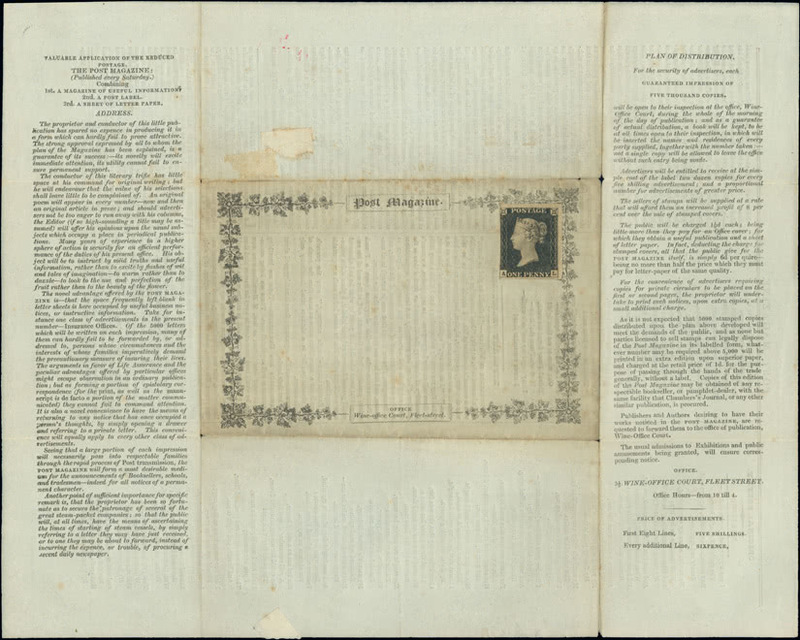 letter sheet used 1840 (Dec.) with London experimental black M.C., 1840 1d. plate 2 CE with margins almost all around on 1840 (Aug.) prices current from London to Ireland, plate 3 EJ with clear to good margins and black M.C. on 'Post Magazine' front, 2d. plate 1 PJ with full margins and red M.C. 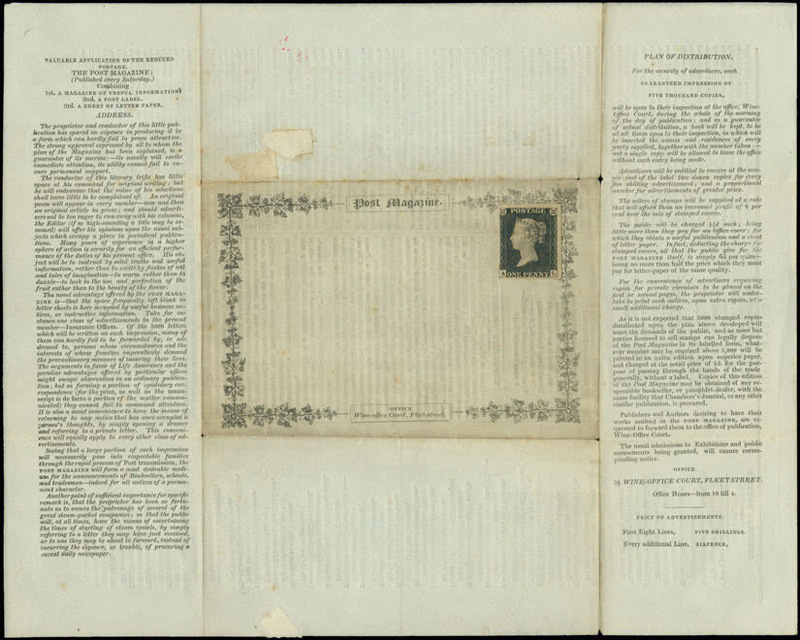 (small faults), 1855 (March) E. from Nottingham to Naples with 1854 SC16 2d. plate 4 FD-FE pair and cut square 1847–54 embossed 1/- (faults), 1855 (July) E. from London to Frwance with SC14 2d. plate 5 CA-CB pair, 1856 (July) registered E. from London to Wellington with 6d. embossed, 1d. (2) and 2d. stars, 1857 (Dec.) E. from London to Spain with 1855–57 1/- LC14 1d. and 2d. plate 6 (2), etc., condition varies. 1840 1d. black plate 4 HA very fine unused with good margins and affixed to an equally fine unused example of the first edition of the ''Post Magazine'', housed in glazed frame. Photo. 1840 1d. 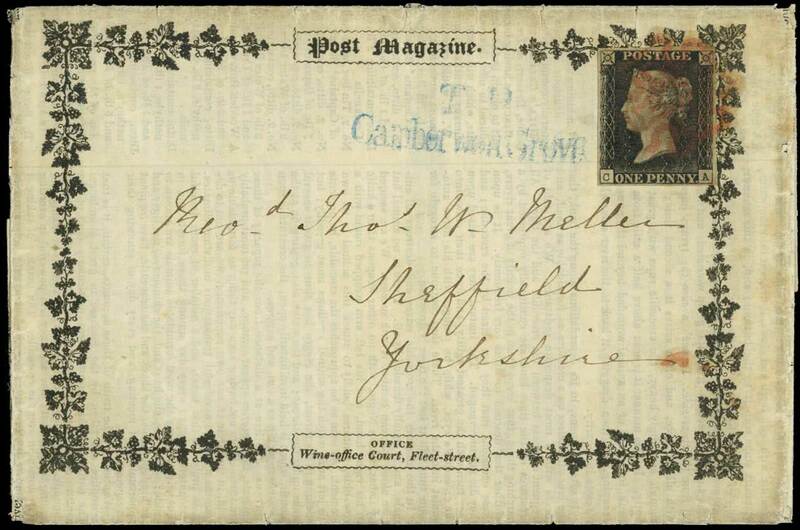 black plate 5 CA, fine used on ''Post Magazine'', tied by red Maltese Cross, with ''T.P./Camberwell Grove'' in blue, sent from London to Sheffield, few minor imperfections, otherwise fine and rare. Photo. 1840 1d. 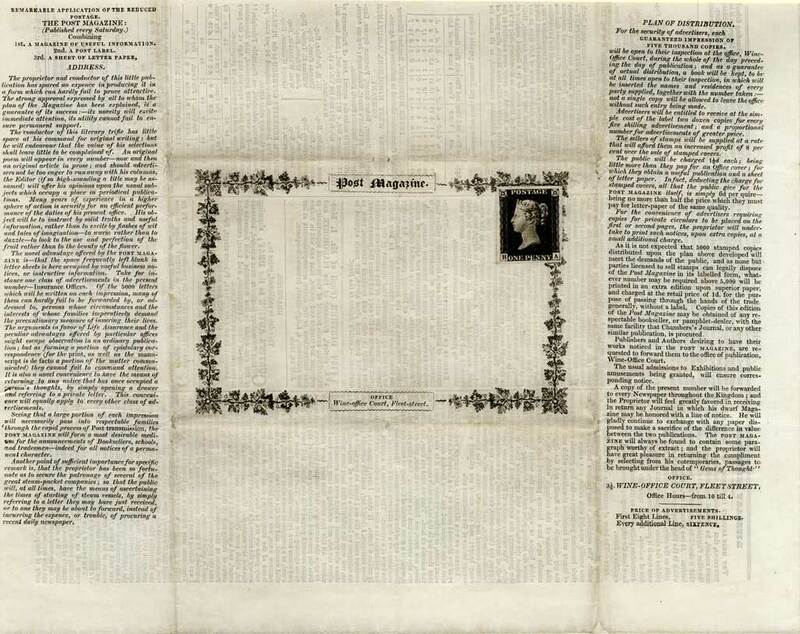 black plate 1a AL unused with good to large margins three sides, cut into at left, and affixed to a good unused example of the first edition of the “Post Magazine”. Photo. 1840 1d. black plate 1b TD unused with good to large margins three sides, cut into at left, and affixed to a good unused example of the first edition of the ''Post Magazine''. Photo. 1852-53 alphabet II 1d. 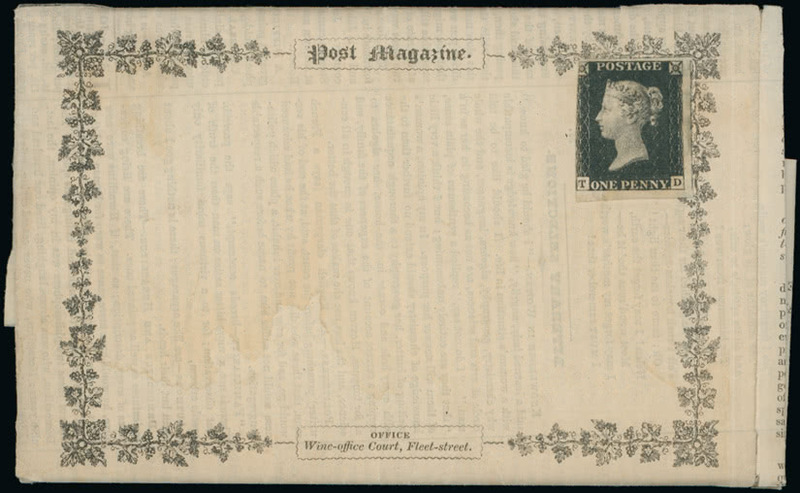 red-brown plate 176 AG, three margins, used on ''Post Magazine'' envelope to Bungay, adhesive with faults incl. lower right corner torn, very rare. S.G. Spec. B2, cat. £2,900. Photo.